Wisdom of Life. 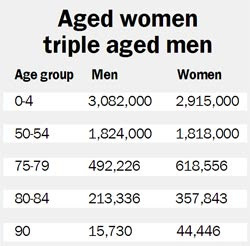 : Why women outlive men? Do you know life insurance premium for female is lesser than the male counterpart in term of age calculation? According to the mortality tabulation, female outlives man worldwide. Is true! Because i think women talk and gossip more than men. My little darling said men live in caves and women are not. Men speak only when is necessary, whereas women are more expressive in every sense. Don't believe me, please look around the coffee shops and the market places. Men might be sipping their drinks and reading the newspapers within their tables. The women are different, they could be talking endlessly within themselves until the children or husbands be calling them home. They just love to talk when they have the time and opportunities. So what is there to be related to living a longer life for women? I believe talking allows one to think and be more creative. In doing so, one could express yourself truthfully when the heart is happier and lighter. Those who seldom talk and speak, tends to be lonely or lonesome. By pouring out your thought and emotion, one gains the satisfaction and contentment. Ladies might be good gossipers or naggers, but they have no frustration and anger after their long winded gossips. Not like men who hide everything inwards, which might not be good for the heart in the long run. Little darling is worried because i speak and talk more than her. Though i don't gossip, i love talking as a hobby. I speak my mind while selling and i share my ideas on platforms. Talking could really energise and vitalise me. Otherwise i would not be writing everyday to share my thought on blog. To my dear friends and readers, if you want to live healthier and merrier, please attempt to talk more than you should. You will survive longer. All these are observed while selling life insurance, a product which deals with people and lives. Have you heard of this - "Saying that men talk about baseball in order to avoid talking about their feelings is the same as saying that women talk about their feelings in order to avoid talking about baseball" - Deborah Tannen, You Just Don't Understand. Thank you for coming over here. I am glad my ideas rocked your thought. Please feel free to ask. Either you write on my comment or reach me at my email address,robertfootenwah@gmail.com.